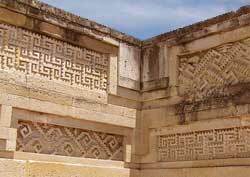 Mitla is famous for the arresting 3-D geometric designs on its building walls (see photo). The Mitla ruins we see today date back to 200 AD and were constructed by the Zapotec civilization (though their successors, the Mixtecs, added some touches). Ancient Mitla was a major religious center. Sometimes the high priest was more powerful than the king. There are five major groups of ruins. Three are essentially rubble. Of the two remaining, the Columns Group is the best preserved and the most visually interesting. The House of Pezelao is its star attraction and my personal favorite. The design of each frieze panel is different from its neighbor's (see photo). This makes the overall collection exceedingly eye-catching. According to myth, you will learn how many years you have left by the distance your hands can reach around this large monolith (seems unfair to short people).